Home → Community Outreach → Deltas Support the Arts! 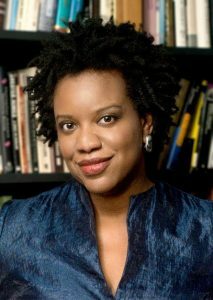 Author LaSHONDA KATRICE BARNETT was born in Kansas City, Missouri, in 1974, and grew up in Park Forest, Illinois. 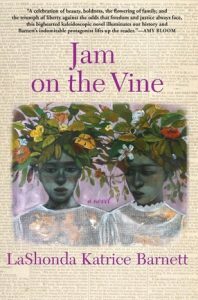 She is the author of the debut novel Jam on the Vine (Grove 2015; paperback 2/2016) and a story collection (1999). 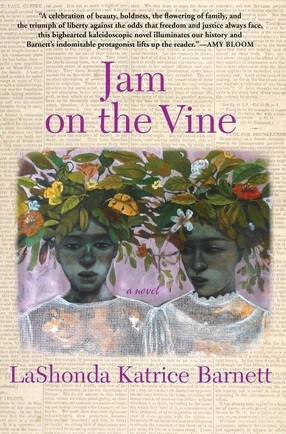 Designated a Stonewall Honor Award by the American Library Association (2016), Jam was an Editor’s Choice pick at the Chicago Tribune; won ElIe Magazine’s Belle Lettres 2015 Reader’s Prize. ​A lover and scholar of music of the African diaspora and an avid interviewer, Barnett has conducted over one hundred interviews with women musicians and edited the volumes, I GOT THUNDER: Black Women Songwriters On Their Craft (2007) and OFF THE RECORD: Conversations With African American & Brazilian Women Musicians, (2015). She has hosted her own jazz radio program on WBAI (99.5 FM, NYC); taught ‘Women in Jazz’ at New York City’s Jazz at Lincoln Center; and lectured on the music nationally and in Austria, Brazil, France, Germany and South Africa. A graduate of the University of Missouri, Sarah Lawrence College and the College of William and Mary, where she received a B.A. ; M.A. in Women’s History and the Ph.D. in American Studies, respectively; she has taught history and literature at Columbia University, Sarah Lawrence College, Hunter College and Brown University. A New Yorker, for the 2016/17 academic year Dr. Barnett is a visiting professor at Northwestern University, where she’ll teach full time in the African American Studies and Gender and Sexuality Studies departments. 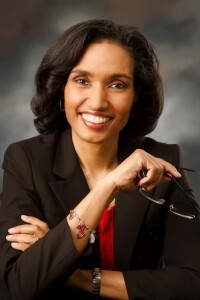 Author Kara Davis, M.D. received her undergraduate education at the University of Illinois in Urbana, Illinois. She attended medical school and completed her residency training in internal medicine at the University of Illinois in Chicago. She remained at the University of Illinois serving as an Assistant Professor of Clinical Medicine for ten years. She currently practices in the Chicago land area. She is certified by the American Board of Internal Medicine. 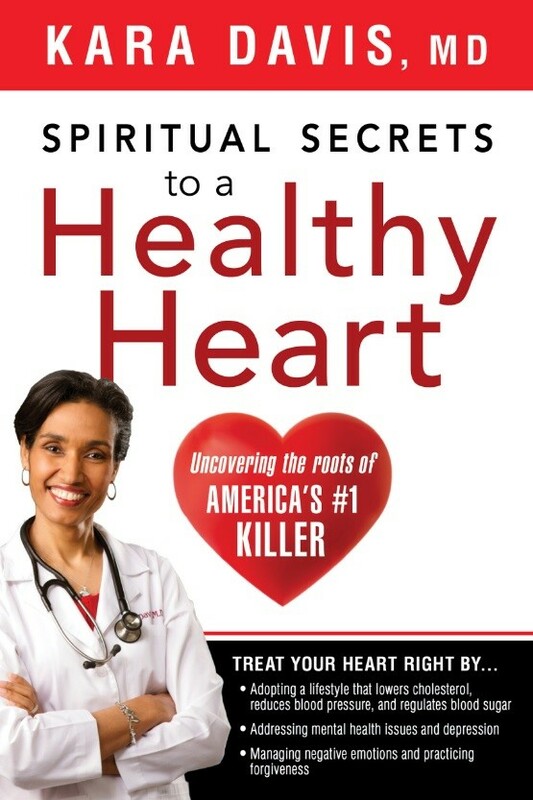 Dr. Davis, author of four books devoted to the preservation of good health, has a special interest in the connection between mental, emotional and spiritual well being with physical disease. She is a firm believer in the importance of health preservation through lifestyle modification, particularly the role of diet and exercise in disease prevention. She has done research in the area of obesity in African-American women, and in lowering the risk for type 2 diabetes in minority populations. She currently serves on the speaker’s bureau for the Live Empowered Executive Council of the American Diabetes Association, a council comprised of health professionals who are devoted to lowering the incidence of diabetes in minority populations. 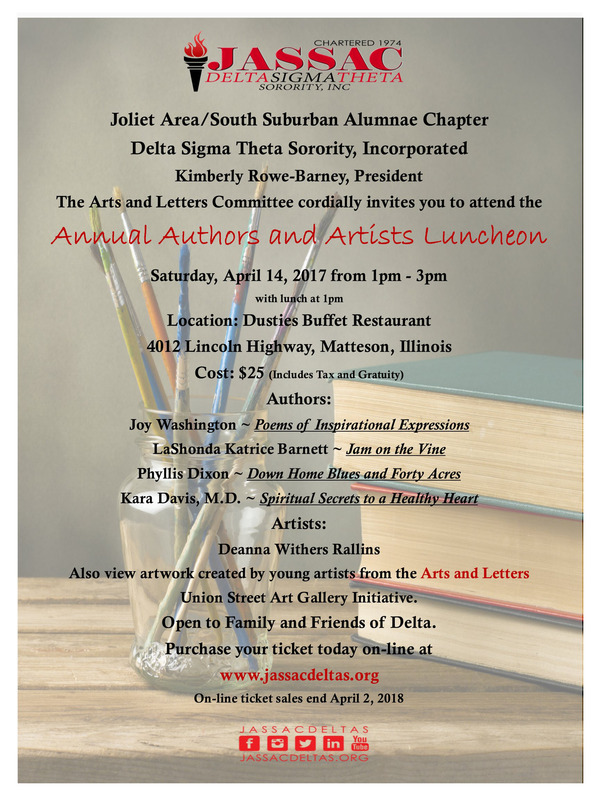 She is a member of Joliet Area South Suburban Alumnae Chapter of Delta Sigma Theta. Author Joy Washington-Retired Chicago Public School Teacher and graduate of Northern Illinois University and Loyola University of Chicago. Her book of poems tiled, Poems of Inspirational Expressions is a collection of witty, Christian based poetry that reflects modern day experiences. Her next publication titled, A Choice to Live Beyond the Rapture is soon to be published. She is a member of Joliet Area South Suburban Alumnae Chapter of Delta Sigma Theta. Artist Deanna Withers Rallins is a Native Chicagoan. She is a graduate of The School of the Art Institute of Chicago where she studied photography and printmaking. Rallins’ many accomplishments as a professional exhibiting artist include solo and group shows at the Museum of Science and Industry, The School of the Art Institute of Chicago, Seabury Gallery, Triangle Gallery of Old Town, the South Side Community Art Center, River East Art Center, and Gallery Seven. She has been asked to serve as a curator for several professional art shows in Chicago and the surrounding area. She was assistant curator in New York City for an artist belonging to the Society of Illustrators. 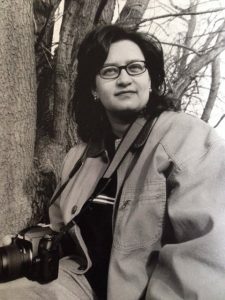 In 2001 and 2007 Rallins worked as the artist/photographer and mural coordinator on two projects for the Sinai Community Institute in Chicago. Enjoy book summations, book signings and beautiful art to enhance your soul and spirit. Saturday, April 14, 2018 from 1:00 p.m. – 3:00 p.m. In August 2015: JASSAC Deltas and friends came out on opening night in support of the highly-anticipated thriller, The Perfect Guy. 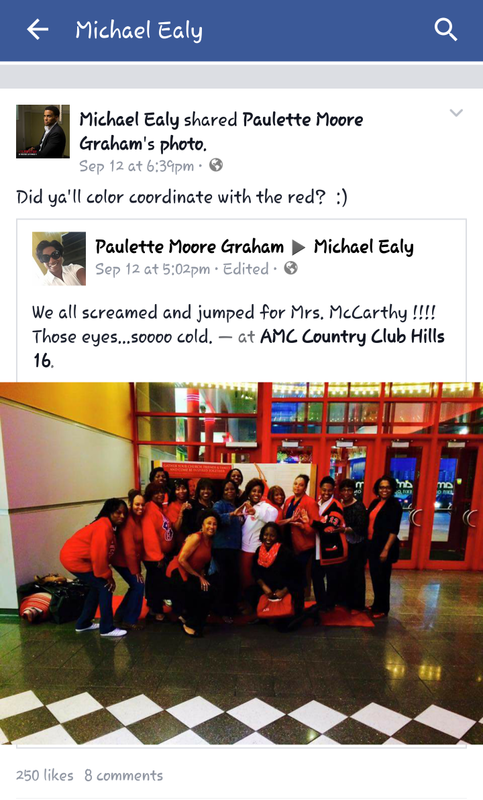 This RED Carpet Event was hosted by the Arts and Letters Committee of Joliet Area/South Suburban Alumnae Chapter and more than 30 chapter members were in attendance at the AMC Loews Theater in Country Club Hills, IL. The Perfect Guy included some of Hollywood’s most talented African-American actors and actresses, including Sanaa Lathan, Morris Chestnut and Michael Ealy. JASSAC is proud to support RED Carpet events that depict African-Americans in the primary storyline.